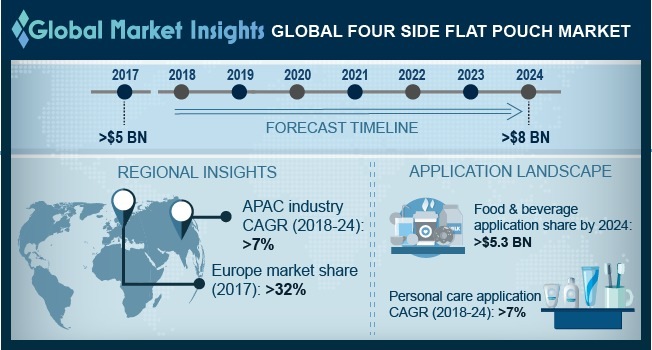 Global Four Side Flat Pouch Market size is estimated to exceed USD 8 billion by 2024; according to a new research report by Global Market Insights, Inc.
Changing lifestyle and inclination towards fast food will offer positive outlook for industry growth. Rising need of packaging specially for ready to cook food owing to the busy lifestyle of the consumers will support the industry growth. Factors such as convenience to carry, flexibility, strong sealing strength and vacuum finish are positively influencing the four side flat pouch market growth. In addition, cost effectiveness, maintaining freshness, and light weight properties of the product are driving the business demand. Increasing packaged food and beverages demand across the developing nations will propel the global four side flat pouch market size. Increasing usage of the product in pharmaceutical industry has positively influenced the industry growth owing rising rate of infectious diseases. Presence of multiple substitutes such as paper bags, boxes and metal cans will restrain the industry growth. Increasing cost of raw materials such as polypropylene and polyethylene will have a direct impact on the product price trend. Stringent regulations on recyclability of materials are expected to hinder industry growth from 2018 to 2024. Polyethylene material volume share crossed 900 kilo tons in 2017. Low production cost of polyethylene as compared to other plastics has propelled the product demand. Polypropylene material holds over 25% of the industry share in 2017. This can be credited to its properties such as low density, light weight, high heat resistance, durability and high clarity. Personal care application is expected to be valued at over USD 1.2 billion by 2024. Growing population coupled with rising per capita income of consumers has enhanced the product penetration. The increasing demand for personal care products owing to its various usage in skin care, oral care, make up and hair care, positively supports the revenue generation. Asia Pacific four side flat pouch market size is anticipated to witness growth at over 7% from 2018 to 2024. Growing food and beverage industry has projected to propel the business growth. This can be credited to increasing penetration of packaging industry mainly in urban areas. Europe four side flat pouch market captures share of over 32% in 2017. The region is expected to witness a decent growth owing to the growing travel and tourism industry in Germany, UK, France and Italy. Changing habits of the people along with rising demand from consumers for small and convenient packages will propel the business growth. Shifting preference of consumers for pouches over conventional bottles and metal cans specially in pet food, baby food and detergents will fuel the business growth. Smart Pouches, SN German Pouch Pack Technology, Swiss Pac and Smurfit Kappa are among major four side flat pouch manufacturers. Product innovation, mergers and acquisitions and expansion of product portfolio are the major strategies adopted by industry participants. Other considerable companies include Fresco, Frain Group, The Dow Chemical Company, Ampac, Pakona, Neo Pack and Shunchi Packing.